If he had never become Prime Minister, Paul Keating’s place in Australian history would still have been assured. He was the Treasurer who deregulated the economy; the weaver of Labor’s modern story; its heavy weapon in the parliament. He was also the great enigma - a self-educated boy from Sydney’s working class and a defining element of the head-kicking Labor right who loved Paris, Mahler and Second Empire clocks. Paul Keating did become Prime Minister. In December 1991 he wrested it from Bob Hawke and the bruises from that struggle were part of the baggage he brought to the job: the other parts included the worst recession in 60 years and an electorate determined to make him pay for it. Keating defied the odds and won the 1993 election, and in his four years as Prime Minister set Australia on a new course - towards engagement with Asia, a republic, reconciliation, a social democracy built on a modern export-based economy and sophisticated public systems of education and training, health and social security. Widely regarded as a quintessential economic rationalist, Keating’s record clearly shows that his vision was infinitely broader and more complex. Don Watson was employed as Keating’s speechwriter. Though a ‘bleeding heart’ liberal trained in history rather than economics, he became an advisor and friend to Keating. 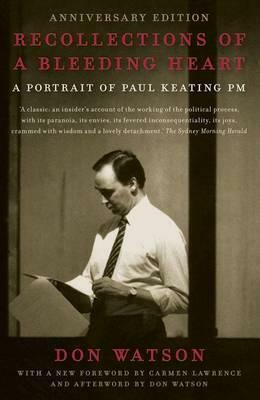 Recollections of a Bleeding Heart - based on the diaries Watson kept through the four turbulent and exhausting years of Keating’s Prime Ministership - is a frank, sympathetic and engrossing portrait of this brilliant and perplexing man, and a unique reflection on modern politics. To celebrate ten years since first publication and with the wisdom that hindsight brings, Don Watson has now written an extraordinary Afterword.